That phrase, read by moderator Maria Baier, set the backdrop for March’s Valley Partnership Friday Morning Breakfast. As a new generation of tourists visit Arizona in droves, exciting new “entertainment corridors” are popping up across the Valley as hubs of hospitality, sports, and dining options designed to attract both tourists and local denizens. The March panel comprised representatives from hospitality and development who discussed these new entertainment corridors and how they’ll impact our tourism and development industries. “No group is more able to explain this (the above phrase) than our panel,” said Baier, Senior Vice President of Public Affairs for the Phoenix Suns. The panel featured Bridget Binsbacher, Director of Operations, Cactus League Baseball Association; Brett Hopper, Vice President, Opus Group; Kim Sabow, President | CEO, Arizona Lodging & Tourism; and Aaron Studebaker, Community Development Project Manager, Salt River Pima-Maricopa Indian Community. Arizona’s tourism data speaks for itself: 44 million overnight visitors; $22.7 billion direct visitor spending; $3.4 billion in tax revenue; and 320,000 hospitality jobs. The Cactus League, a staple in Arizona for more than a century, is also a hit with visitors, Binsbacher said. The scorecard: $644 million economic impact ($315.8 million from out-of-state fans); 6,439 jobs; $31.9 million in taxes; 1.8 million fans in 2018. “With 10 facilities and 15 of Major League Baseball’s teams here, fans can get to multiple stadiums in one day,” Binsbacher said. “Spring training here is on a whole other level. It’s not just about the teams and players, its about those who come to our cities. And the numbers have grown." On the development side, it’s companies such as Opus that leverage the impact of the state’s booming tourism and entertainment industries. In Peoria, Opus has created that type of synergy. In the heart of the Peoria Sports Complex Urban Design District, also known as P83, Opus is bringing a 352-unit, 10-building multifamily development to market. The vibrant, pedestrian-friendly development is a multi-building project on approximately 17 acres at the corner of 75th Avenue and Paradise Lane. Talk about establishing an identity? Studebaker shared a little of that, discussing development along the Loop 101 through Scottsdale on SRP-MIC land. This includes Talking Stick Resort, Top Golf, OdySea Aquarium, and ground-up construction for office and education. Other developments set to open within the year, Studebaker said, are Medieval Times, Great Wolf Lodge, numerous hotels, a mixed-use project – even a White Castle restaurant. For visitors looking to enjoy a world-class resort in a winter oasis or baseball fans looking to enjoy spring training, Arizona is internationally recognized for its outstanding hospitality options. With the ability to serve millions of tourists year-round, Arizona’s tourism remains one of the most critical components of the state’s economy and a significant influence on new development in the Valley. The development community is banking on a strong economy to get things built and help investors buy and sell assets. That was the message from a panel of commercial real estate financial experts at Valley Partnership’s February Friday Morning Breakfast. 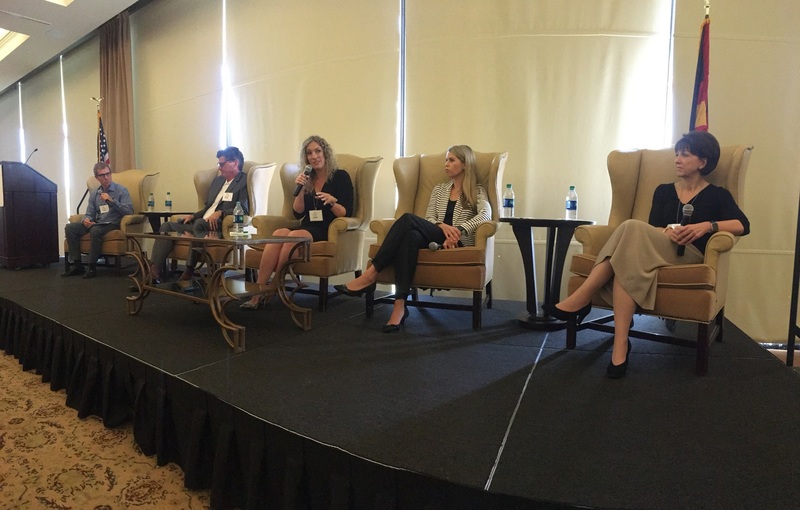 Moderating the panel was Mindy Korth, Executive Vice President, Colliers International. Over the past two years, a strong American economy brought record lows for unemployment and healthy investments on both Wall Street and Main Street. Real estate investment opportunities exist in almost all asset classes, said Ann McCartney, Vice President, Debt & Structured Finance, CBRE. Bridge loans, she said, are popular in some development circles. This includes ground up construction or a property that is almost stabilized. Engler agreed that all asset classes are taking advantage of the capital resurgence. Strong asset classes include industrial, multifamily, office and yes, retail. Developers knew midtown Phoenix had potential, especially with the Metro light rail on the way. Then the Great Recession hit. Banking on a more robust economy, Plaza Companies collaborated with Holualoa Companies to redevelop Park Central. Pierson said he is seeing a fair number of deals in that submarket. McCartney added it’s all about new jobs and demographic changes in midtown and downtown Phoenix. More room to run. Office fundamentals in a good place. Rent growth in retail. Industrial uptick in delivery. Those were just a few of the comments shared by panelists at the September Valley Partnership Friday Morning Breakfast. It was news that perhaps came a surprise. But it’s evident that commercial real estate in the Valley is on the upswing in a big way. Moderator Chris Toci of Cushman & Wakefield took the sell-out audience for a ride across the Valley, asking why companies seeking out Phoenix and its surroundings markets. Is it more than the weather? What are the hot spots? What is driving companies to come here? What is Arizona doing to land these new companies? Michael Petrivelli, a market analyst with CoStar, provided answers. Assessing how property types are doing across the Valley, he had this to say. “Office fundamentals are in a really good place. Vacancy rates have tightened. There is an uptick in delivery of industrial products and vacancies are at all all-time low. Retail is doing well as household growth and income continue to climb. “Overall, the picture looks good. We will see some of the strongest job growth through 2022,” he said. The topic of co-working space produced some interesting thoughts. Asked if co-working startups are going to survive, Tiffany Winne, Executive Vice President with Savills Studley, said they are not. Supply and demand is also driving the Valley’s commercial real estate hot market. Winne said she doesn’t see any crossover. Winning submarkets in the Valley? Deer Valley and Gilbert, Smidt said. USAA is adding to its already expansive operation in North Phoenix. Deloitte is opening a 102,000 SF U.S. delivery center in Gilbert. Jabjiniak said it’s companies such as EdgeCore, which recently broke ground on a $150 million, 180,000 SF date center in Mesa, that are selecting his Southeast Valley city.